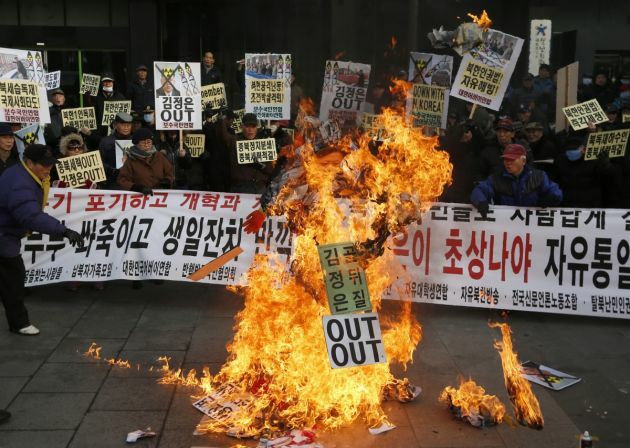 (Photo: REUTERS / Kim Hong-Ji)Protesters burn an effigy of North Korean leader Kim Jong Un during a rally denouncing former U.S. basketball star Dennis Rodman's visit to North Korea and Kim Jong Un on Kim's birthday in central Seoul January 8, 2014. Rodman, in a television interview on Tuesday, appeared to blame Korean-American missionary Kenneth Bae for his captivity in North Korea, the latest in a series of controversial comments by the former U.S. basketball star. For the 12th straight year, North Korea is the most difficult place on earth to be a Christian, Open Doors, World Watch List for 2104 finds. "The God-like worship of the leader, Kim Jong-Un, and his predecessors leaves no room for any other religion, and Christians face unimaginable pressure in every sphere of life," says Open Doors, a non-denominational advocacy group. North Korea, Somalia and Syria are the three most difficult places to be a Christian says the report that is released each year. Iraq folllows in fourth place. Christians in North Korea are forced to meet in secret and they dare not share their faith even with their families, fearing imprisonment in a labor camp. "Anyone discovered engaging in secret religious activity may be subject to arrest, disappearance, torture, even public execution." WWL says that despite the severe oppression, there is a growing underground church movement of an estimated 300,000 Christians in the country that has a population of nearly 25 million. Somalia gets the second place as the most difficult place to be a Christian, says WWL noting that there is no provision for religious freedom in the constitution of this Islamic kingdom. "Pressure is increasing on the tiny Christian community in this Muslim-majority country. Islamic leaders and government officials publicly reinforce that there is no room for Christians, and there is a strong drive to purge Christianity from Somalia." WWl says the militant Islamist group, al-Shabaab, is targeting Christians and local communities. "There is a high level of fear and mistrust among believers, who have to hide their faith for fear of betrayal.," says WWL. In Syria as the civil conflict becomes more and more severe, targeted violence against Christians, said Open Doors International's 2014 World Watch List. The World Watch List, which annually monitors the media worldwide for all reported incidents, emphasises that this is the "very, very minimum" count - only those who have been documented as killed. "The Syrian opposition is increasingly 'Islamizing', and Christians are becoming more vulnerable in all spheres of life. Many Christians were reported to have been abducted, physically harmed or killed, and many churches damaged or destroyed," says the report. It noted that on October 21, Islamist militias invaded the ancient Christian settlement of Sadad, where they killed at least 45 people, and wounded many more. Christians account for some 10 percent of Syria's 24 million peoople. Some of those killed have been targets for Islamist rebels who view them as supporters of President Bashar al-Assad, while others have been killed in the crossfire of battles. Iraq held its spot at No. 4 in the list of but attacks and threat against Christians there increased in 2103. "Islamist terrorist groups, influenced by the conflict in Syria, are increasing in number. One of their aims is to empty the country of Christians, and this situation is aggravated by the government's total authority. WWL quoted one local source as saying that a Christian is killed, kidnapped or abused every two or three days. "Christians are an easy target for kidnappers. Even in the relatively unrestricted, semi-autonomous Kurdish region, the security situation for Christians is deteriorating," says the report.